Hotel Address:Rampart View Guest House, No. 37, Rampart Street, Fort, Galle, Sri Lanka. 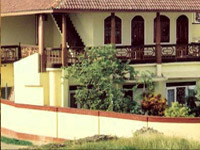 Rampart View Guest House is situated overlooking the sea and it has rooms with sea view. The view of the sunset & sunrise is what unique and the big terrace where the guests could have the sun bath is what differentiates our Guest House. The view of the ocean, Southern & Northern side of galle. It is only five minutes walking distance from the Galle town to our Guest House. We at Rampart View will deliver reliable and personalized service. The Meaning of Rampart is, a wall which is built from rocks and constructed by the Portuguese and renovated by the Dutch. This wall surrounded the fort and has two entrances to enter the fort.The Dutch fort in Galle is unique surrounded by a wall which is 400 years old and one side of the wall is the natural galle harbor, other site is the International Cricket Ground. this fort is a UNESCO world heritage site. Transportation to the guest house can be arranged on request. Serving of food on request, Sri Lankan, Western & Chinese. Breakfast, Lunch and Dinner. Address Rampart View Guest House, No. 37, Rampart Street, Fort, Galle, Sri Lanka.